So where does one get leads? That is where I left off last time in the series. It is a critical topic to cover as we delve further into the sales process. Because it is such a big topic though, it is best to tackle it by breaking down the parts. People often just refer to leads, but that obscures the full picture. It is more than just the lead itself; it is the process of finding leads, properly identifying leads and knowing how to handle leads. When the topic of leads comes up, most non-sales people picture the movie Glengarry Glen Ross and Alec Baldwin waving a bunch of index cards in the air. I have personally worked with customers in the not so distant past where the process was not too dissimilar. The way sales often worked involved buying lead lists of dubious quality, scouring phone books, or even going door-to-door. Lead Acquisition – This is HOW you came to obtain leads or, in other words, the process. You may do research, buy leads, hold events or a number of other activities, but the point is that you have to find relevant people to contact. 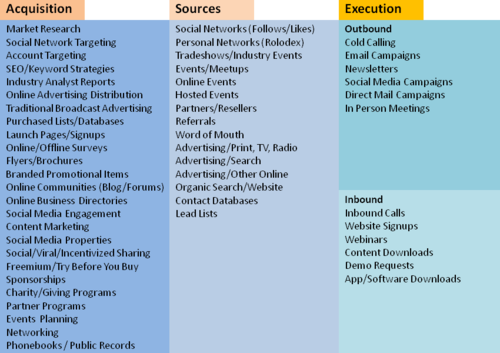 This is important to understand as you measure the cost and effort required for each lead acquisition strategy you employ. Cost per lead and lead-to-opportunity conversation ratios are important inputs into measuring the overall customer acquisition cost (CAC). Lead Source – This is WHERE you got the leads from. There can be any number of ways a lead can enter your leads process. It is the point when you acquire the actual contact information that you can record the lead source. Often the acquisition and source will be one in the same, but remember that acquisition is about the process or program to acquire leads rather than the actual point of acquisition. It is lead source that gives us a clear understanding of lead quality. Lead Execution – This is the WHAT you do with the lead. This includes action that you initiate (outbound) as well as actions that are initiated by leads (inbound). Once the lead enters your lead process tagged with the appropriate lead source, it is now up to you to figure out how to qualify those leads thoroughly enough either to pass them along as deals to sales, discard as never an opportunity or recycle through your marketing program. Why is it important to make such distinctions? Because it helps us to think strategically about lead generation. It is far easier simply to think in terms of quick wins and near-term tactics. While the ability to be flexible and change gears quickly is beneficial for startups, it can backfire because it results in disjointed efforts that waste precious time and money. Often this becomes an issue with startups that are lured into dubious events, programs and the like that offer very little in the way of relevant leads but often end up costing a bundle. Without a strategic marketing vision, it is easy to fall into these traps. That includes the seemingly “good programs” that are supported more by myth and “sound wisdom” than actual results. I am here to tell you that I haven’t a clue which method is best for you because it depends on your business, your industry and your solution. Anyone that tells you otherwise is a charlatan. The best ways of acquiring leads depend on what works for you at your particular stage of growth or strategic direction. All I can tell you are the programs and methods to avoid because time and time again they have proven to be of low value. The only way to know the “best” methods is to test and measure, test and measure and repeat that over and over again. Thus, this exercise of separating out acquisition, source and execution is simply a means to help lead us to that test and measure mentality. I will probe more into details of each over the next several days, but for now I have provided the above chart to help list out just some of those acquisition tactics, sources and execution methods. It is simply illustrative, and some things may meld into each other, as I touched upon earlier, but hopefully this helps you to start thinking strategically about your own lead generation process and how you will measure effectiveness. Remember, a large part of this exercise is to improve upon what you are doing, and as the saying goes, if you cannot measure it, you cannot improve it.